Want The Best Selection? Get In Early! How Can You Shop Early? Check out the options below and we will see you at the sale! Please note: Passes are required for all Presales. Team Member and Consignor Passes are emailed after Drop Off and must be downloaded/shown on phone for entry. All other passes are available for purchase or download via the "Get Tickets" Button On our Home Page. Prime Time shopping: If you do not qualify for one of JBF's free presales, you don't have to miss out on the chance to shop first. The cost for this special shopping opportunity is $12 in advance, $15 at the door. You get to shop after the Consignor Shopping Time & get a FREE JBF Reusuable Shopping Bag with your Prime Time Ticket purchase. You can purchase your prime time shopping pass in advance to secure your spot to shop this special PreSale Shopping Time & save $3! 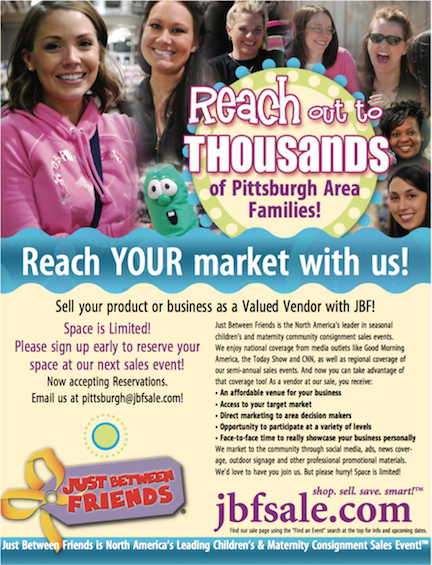 At our JBF Greater Pittsburgh Sales Events, we love helping area associations and groups by being a fundraising partner! 1. Want to earn some money for your school and/or PTA/PTO? Use JBF as a fundraiser, it's easy! We provide you with flyers either via print or digitally that are specifically for your school. You pass them out to all of the students, faculty, families, etc. They bring them with them to shop and turn them in at checkout. We give you a % of the sales from everyone that turned them in at the sale! Interested in learning more? Contact us today! We are accepting nominations for organizations to help us at the JBF Sale in return for a $250 donation to the organization or a cause that the organization supports! We'd love to have an ongoing relationship with this organization, which provides a fundraising potential of $500 per year if your group participates in both of our events! 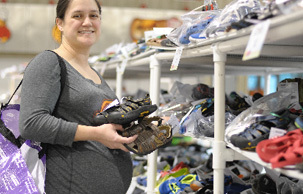 Pittsburgh Moms Blog - Special Thanks to our partners at Pittsburgh Moms Blog! 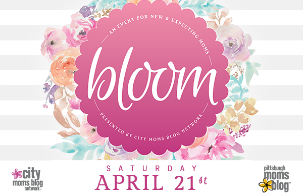 Click here for more information on their Bloom Event for new & expecting moms, coming April 21st!